Home sales in Ox Bottom Manor continue to flourish, as 2014 begins with unit sales averaging nearly 4 homes sold each month. 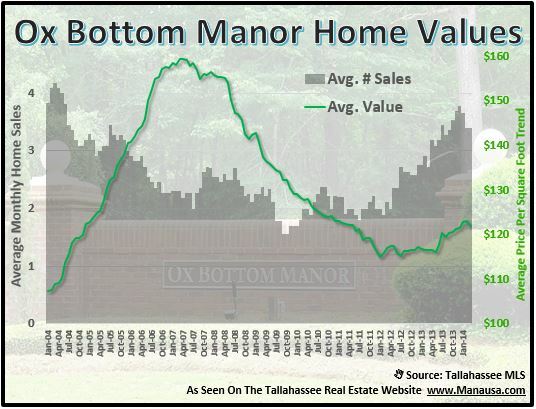 As one of the top selling neighborhoods in Tallahassee (along with Southwood, Killearn Lakes Plantation, Killearn Estates, and Bull Run), we keep a close eye on the Ox Bottom neighborhoods to stay on top of the changing trends for the entire Tallahassee real estate market. Thus far in 2014, there have been 4 homes sold in Ox Bottom Manor, with an average sales price of $363,000 and a value of $124 per square foot. That means you are getting a 2,927 square foot home for just over $360K in a highly desirable NE Tallahassee neighborhood. Currently, there are 9 homes for sale in Ox Bottom Manor, only 1 is already under contract, and most are priced below the averages identified above. After hitting a market low of roughly $115 per square foot at the beginning in 2012, Ox Bottom has seen home values rebound and return to roughly $124 per square foot on average. Like most areas in Northeast Tallahassee, the 32312 zip code had a great rebound year last year, but values have dipped somewhat thus far in 2014. The small dip at the end of the green line below shows a similar dip for Ox Bottom Manor, and time will tell whether this will go on for the entire Spring or if it is just a short term trend. 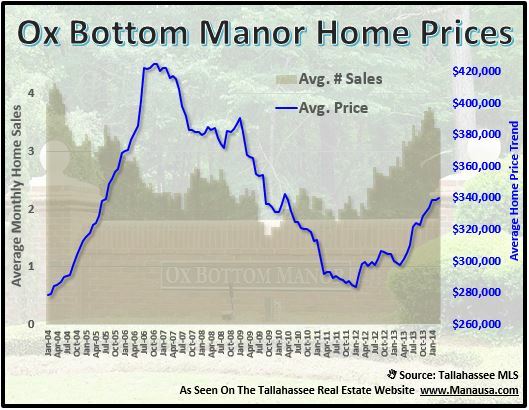 The average price of a home sold in Ox Bottom Manor thus far in 2014 is $363,250, and it continues to pull the one-year trend higher. The real estate graph below shows the average price for a home sold over the past year has reached $340,000, up more than 25% from just two years ago when the market reached its bottom in Ox Bottom. With the falling number of distressed properties available in the entire 32312 zip code, their impact on the "average" will be greatly reduced, likely allowing prices to continue higher in 2014. The following map shows the Ox Bottom Manor homes that are on the market today. If you want more information on a particular home, simply click on the marker on the map and it will open up the listing to show you up to 25 pictures of each home. The following is a list of all homes sold in all of the Ox Bottom neighborhoods (recorded in the Tallahassee MLS). I hope you were able to learn something from this Ox Bottom Manor Home Sales Report, please drop me a note if you have any other questions or concerns that I can help you with.